We carried out a study on Scots pine (Pinus sylvestris L.) in Sweden, where our objective was to quantify the genetic diversity and inbreeding associated with two widely used managed-regeneration practices, planting with improved material from seed orchards and seed-tree regeneration, and compare these with that found in unmanaged natural forests. A total of 196 evenly spaced trees were sampled from a naturally regenerated and two managed-regeneration stands (plantation and seed-tree), in each of three different regions in Sweden (Arjeplog, Vihelmina, and Hammerdal). Population parameters were estimated for microsatellite loci from the nuclear and chloroplast genomes (5 and 11 loci, respectively) and a single mitochondrial locus (nad7). Analysis of variance (ANOVA) shows no significant effects of stand management on the level of nuclear and mitochondrial genetic diversity or inbreeding (p < 0.05). Duncan post-hoc analysis suggested significantly lower values for the chloroplast number of effective alleles (N ea_CP) and total gene diversity (H t_CP) for natural and plantation practices, as compared with seed-tree regeneration. The ANOVA supported a rather weak effect of the management factor (M) on N ea_CP and H t_CP, with p values of 0.08 and 0.07, respectively. Inbreeding coefficient (F 5) indicated a deviation from random mating in all stands caused by an excess of homozygotes. All the stands are composed of a mixture of half- and full-sibs, but no pattern of spatial relatedness was detected in any of them. Our data suggest that genetic diversity is similar in both natural stands and those with managed regeneration, probably because regeneration practices did not decrease the population size to a point where random drift effects might be important. The estimates for the nuclear and mitochondrial (mt) genomes should be regarded with caution, as only five nuclear microsatellite (nSSR) loci less affected by null alleles (<25 %) were analyzed. Our investigation indicates that the reduction to five nSSR loci does not change the main finding of an absence of differences in genetic diversity among stands, except for the number of rare alleles (RA), which is lower when estimated from data for eight nSSR loci. The online version of this article (doi: 10.1007/s11295-015-0850-5) contains supplementary material, which is available to authorized users. We gratefully acknowledge Sonali Ranade, Stefana Ganea, Anna-Maria Rautio, Axel Bergsten, Sara Svanlund, Lydia McCarthy, Anna Hallmén, and especially Mikael Westerlund for conducting the fieldwork. We also would like to thank Per Linder, Fastighetsverket, and Lars Andersson for help with finding and permission to use suitable forest stands. This work was supported by grants from Föreningen Skogsträdförädling and Crops for Future-SLU (TC4F). We also acknowledge the Swedish research Council (VR) and the Swedish Governmental Agency for Innovation Systems (VINNOVA). 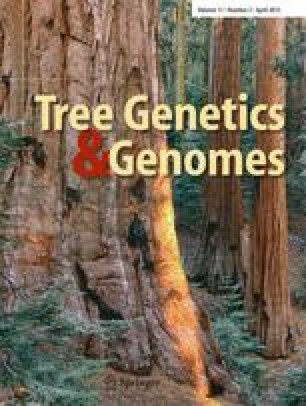 Nuclear SSR, chloroplast SSR and nad7 genotypic data sets were submitted to TreeGenes (https://dendrome.ucdavis.edu/tgdr/) (accession numbers TGDR039, TGDR040, and TGDR041, respectively). The authors declare that they do not have competing interests and they have conducted the study following the rules of ethical and good science practice.